This week, I wanted to venture out into the website I found at the start of the semester: Skillshare. I had originally found this class which focuses on hand-lettering. Unfortunately, I realized that to access full features on Skillshare, you have to have a paid membership. Due to being on a student budget, I ended up watching the initial free video and then going into the completed project examples in the class for inspiration. I decided to recreate it with my own spin using the lettering I’ve practiced! My take on Stephanie’s Quote! Variety of programs and courses: From traditional four-year universities to completely online career colleges, higher education today offers a variety of options for students. This means that no matter what students study, from nursing to neuroscience, they can find the courses or programs they need online. Students can also earn every academic degree online, from a career certificate to a doctorate. Lower total costs: Online programs prove a more affordable option than traditional colleges. Though not all online degrees offer less expensive net tuition prices than traditional colleges, associated expenses almost always cost less. For example, there are no commuting costs, and sometimes required course materials, such as textbooks, are available online at no cost. In addition, many colleges and universities accept credits earned via free massive open online courses (MOOCs), the most recent advance in online education. These free online courses can help students fulfill general education requirements. More comfortable learning environment: Commercials that feature online students studying in their pajamas only skims the surface of one of the benefits of online education: no physical class sessions. Students listen to lectures and complete assignments sent to them electronically, with no need to fight traffic, leave work early for class, or miss important family time. Convenience and flexibility: Online courses give students the opportunity to plan study time around the rest of their day, instead of the other way around. Students can study and work at their convenience. Course material is always accessible online, making special library trips unnecessary. All of these benefits help students balance work and family commitments with their education. More interaction and greater ability to concentrate: WWhile contradictory evidence about the rate of online student participation versus participation in traditional courses exists, one thing remains certain: Online courses offer shy or more reticent students the opportunity to participate in class discussions more easily than face-to-face class sessions. Some students even report better concentration in online classes due to the lack of classroom activity. Career advancement: Students can take online courses and even complete entire degrees while working, while in-between jobs, or while taking time to raise a family. This academic work will explain any discontinuity or gaps in a resume as well. Also, earning a degree can show ambitiousness to prospective employers and a desire to remain informed and prepared for new challenges. Continue in your profession: Even if someone wants to complete a degree, it may not mean they want to leave their current job. For most students today, increasing college costs mandate that some students continue working while in school. The previously mentioned flexibility of online programs enable students to keep working while also pursuing academic credentials. Avoid commuting: During snowstorms and thunderstorms, colleges may cancel classes to avoid putting commuting students at risk of dangerous driving conditions. Rather than miss important class sessions, students in online courses can always “attend” by participating in discussion boards or chat sessions, turning in their work on time, and watching lectures or reading materials. Many students also find substantial savings on fuel costs with no commute for classes. Improve your technical skills: Even the most basic online course requires the development of new computer skills, as students learn to navigate different learning management systems (LMS) and programs. The participation skills students learn within their online courses translate to many professions, including creating and sharing documents, incorporating audio/video materials into assignments, completing online training sessions, etc. Some schools even offer students free laptops or iPads. Transfer credits: For college students who want to attend summer classes, but live too far from their colleges and/or work summer jobs, taking online classes from an accredited college and transferring the credits to their primary college can be beneficial. Students can earn college credit while still enjoying their summer vacation or fulfilling the responsibilities of their seasonal employment. Similarly, if a college or university does not offer enough open sections of a required course, students can take the course online at another college and transfer the credits. On top of these reasons, websites such as Skillshare allow people to take classes that can help them pursue their hobbies and interests, not just academic subjects. This can be a great way for people to look into courses that may not be offered in their local communities; rather, being offered on the global, internet community. There is also the matter of allowing people to be the ones doing the teaching! Skillshare allows people to set up their courses in whatever way they’d like, and is flexible for both the students and teachers. And, since it seems like I’m practically endorsing this website at this point (I promise I’m not! Still on that tight student budget, haha! 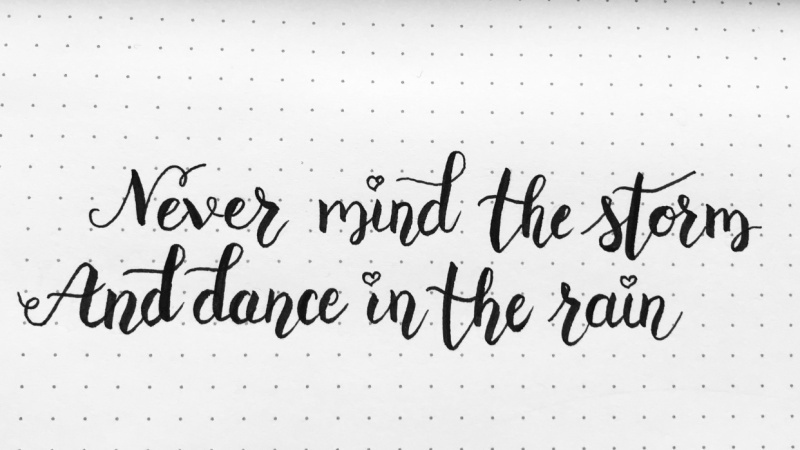 ), I thought I’d do a little Skillshare-inspired calligraphy this week. Do you know of any other websites like this one that allow exploration of skill development? Let me know! So, I’ve found that my learning project has been weirdly tied to my emotions. The more I practice writing, I find myself wanting to write out quotes and sayings that reflect what I’m going through in my life. Perhaps that’s a little strange, and too-much-information when it comes to sharing, but it’s been nice to use calligraphy as a way to escape from reality and de-stress. It is actually quite calming! The effort and care I put into each letter requires all of my attention, so it makes it quite easy to forget my worries. This week, I was feeling sort of emotionally drained. I put on some calming music by Sleeping at Last, and sat down to write. I came across the quote, “Start each day with a grateful heart” and immediately realized how I have to be appreciate of everything that happens in my life, the good and the bad. In my religion, we say the phrase “Alhumdulillah” whenever we want to thank God for something, and I realized that I have to stop thanking Him for just the good experiences and also thank Him for the bad ones; they always teach me something, and I often learn more about myself. So this week, that is what I wrote as I sat in my room to just have a nice, peaceful moment. Here is the playlist I listen to when I am having these peaceful, relaxing moments! This week was pretty tough in terms of my personal life, and I found it hard to carve out time for the things I should have been doing for school. It has definitely set me back a little bit, but I’m learning to focus on what I can change in the future instead of dwelling on the past. So, going forward, I’m trying to be a bit more positive and focus on the things that matter. Although this is a learning project post, it has less progress in terms of my calligraphy and more in terms of my mental health and learning what I need to do to take care of myself. So in a way, I’m still learning — just something a little bit different than what I expected to. As teachers, we will often find ourselves under stress, time restrictions, pressure, and the weight of not just our lives and problems but our students’ as well. It is essential that we make time for ourselves and take breaks when we need them. We have to learn to take care of our well-being in order to serve our students and colleagues in the best way. I recently heard the new(ish) Ariana Grande song, “breathin”. I really took the time to listen to the lyrics and they helped me overcome this tough time so much! Because of this, my calligraphy this week is inspired by the things I learned about what I can do to nurture myself and my mental/emotional well-being in this fast-paced life. I hope you can take something away from this week’s unexpected lesson. My sister talked me through some of the stuff I was experiencing and reminded me to continue to strive on my path to be kind to everyone, despite how they treat me. It was a great reminder and inspired this practice piece. Lastly, to be happy, I must choose to be. It’s okay to get rid of negative things in your life if they affect your state of mind!